I’ve traveled to Mexico on multiple occasions and yet still have barely seen any of this enormous country. In recent years Mexico has had a lot of negative publicity, but I’ve traveled to the US-Mexico border, the Yucatan peninsula, visited Mayan ruins and experienced world-class scuba diving. Mexico has a huge variety of landscapes, culture and unique foods waiting to be experienced. I loved my trips to Mexico, discover more about this beautiful country in my posts below. It’s no wonder why Izamal was listed as one of Mexico’s magic towns when you see the beautiful architecture and historic character it’s streets offer. 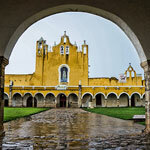 This week’s photo is of Izamal’s colonial Franciscan monastery on a rainy day. 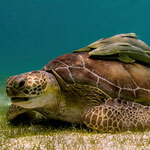 This week’s photo is of a sea turtle feeding on sea-grass in Akumal, Mexico. Attached to it’s shell are 3 large remoras (suckerfish). Visiting the Parque Natural Rio Lagartos in Northern Yucatan, Mexico before heading to the Ek Balam ruins. 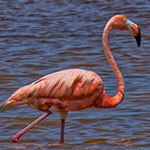 A boat ride to watch flamingos & wildlife before a natural salt mud bath and a visit to the nearby town. 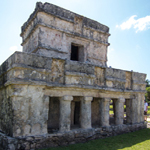 There are many notable ruins in the Yucatan area of Mexico including Tulum, Chichen Itza, and Coba. 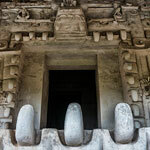 Ek Balam is probably the least well-known of the 4, and even though I’ve visited many Mayan ruins throughout Central America Ek Balam stands apart from the rest. 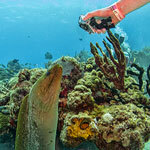 A large green moray eel gets curious and comes out from his hiding place to pose for another diver’s camera while scuba diving the reef in Cozumel, Mexico. 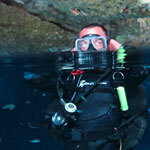 Video filmed from scuba diving inside one of the Yucatan’s famous cenotes – Dos Ojos. There are many excellent cavern dives in this area of Mexico and Dos Ojos is no exception. If you ever wanted to know what it looks like underwater inside a dark cave watch this! 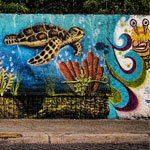 Check out this street art in Cozumel, a large Mexican island in the Caribbean Sea. The wall is full of marine life, intended to raise awareness for Cozumel’s national marine park. 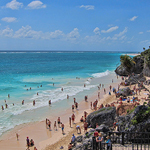 Tulum, the 800+ year old Mayan ruins sit atop 40 foot cliffs on the edge of the Caribbean sea. Today’s photo of the week is of the breathtaking beach sitting just a few feet from those ruins. This week’s picture is of Akumal beach, south of Cancun and Playa Del Carmen in Mexico. 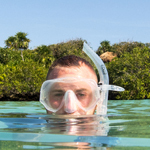 Home of world class scuba diving, snorkeling and endangered Green Sea Turtles. 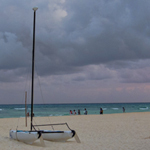 A cloudy sunset with a warm ocean breeze; how I spent a wonderful afternoon on the beach in Playa Del Carmen, Mexico. Tulum might be one of the most famous Mayan ancient ruins but does that mean it’s a great travel destination? It’s very hot and very crowded – but it has an amazing beach. Get tips for visiting here. Xel-Ha is claimed to be the world’s largest natural aquarium. Discover why my time at this water park met and greatly exceeded any expectations I had.